Full Output: 200+ AMPS @ 1200 Engine RPM ! Direct Fit | Bolt-On | Plug & Play - This is an exact-fit high output alternator designed specifically for your Kia Rio. No modifications to the Kia Rio are necessary! Our unit mounts the same as your factory Kia Rio alternator and utilizes the same electrical connections. 100% Brand New! Made in the USA! - We don't require a core charge because all of our inventory is 100% Brand New. Watch out for the other guys selling 'rewound' junk. "If they want your core, find a better store!". The Best One Year, No Hassle Warranty! - Unconditional warranty like no one else in the business. If you have a problem with your high output alternator we will repair it at no charge to you for one year! Monster Audio Performance - This alternator was designed specifically with high amperage audio performance in mind. Many customers use PowerBastards.com high output alternators competitively in stereo competitions around the globe! 100AMPs @ Idle and Full Output Available at a Low 1200RPM! - Delivers the power on board your Kia Rio when you need it, across the entire RPM range. The other guys expect you to spin your engine to 6500RPM before their alternator makes the rated output while their idle output is actually lower than your factory Kia alternator! Daily Driver & Competition Ready - All of our alternators can be used for daily driving or competitions without a problem. These are the most reliable, highest output alternators on the planet designed specifically for your Kia Rio. Our unconditional one year warranty backs it up as well as our customer testimonials. Buy with Confidence! - PowerBastards.com is Better Business Bureau Accredited and has always maintained an 'A' rating. This alternator is perfect for anyone needing to beef up their vehicle's current electrical system. Each unit is dyno tested before shipment to ensure you receive a working unit the first time. 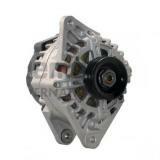 The components inside this alternator are heavy-duty, high amperage and brand new. We use the highest quality components to build the best high output alternator, ensuring your unit will last long and run quietly. One Year No Hassle Warranty! We believe in our product so much that we back it with a one year, no hassles warranty from the date of purchase. These units are in stock and ready to ship. Place your order before 3PM EST Monday-Friday and your order ships the same day! Powder Coated units usually ship next day! Direct Fit | Bolt-On | Plug & Play - This is an exact-fit high output alternator designed specifically for your Kia Rio5. No modifications to the Kia Rio5 are necessary! Our unit mounts the same as your factory Kia Rio5 alternator and utilizes the same electrical connections. 100AMPs @ Idle and Full Output Available at a Low 1200RPM! - Delivers the power on board your Kia Rio5 when you need it, across the entire RPM range. The other guys expect you to spin your engine to 6500RPM before their alternator makes the rated output while their idle output is actually lower than your factory Kia alternator! Daily Driver & Competition Ready - All of our alternators can be used for daily driving or competitions without a problem. These are the most reliable, highest output alternators on the planet designed specifically for your Kia Rio5. Our unconditional one year warranty backs it up as well as our customer testimonials. Direct Fit | Bolt-On | Plug & Play - This is an exact-fit high output alternator designed specifically for your Kia Spectra. No modifications to the Kia Spectra are necessary! Our unit mounts the same as your factory Kia Spectra alternator and utilizes the same electrical connections. 100AMPs @ Idle and Full Output Available at a Low 1200RPM! - Delivers the power on board your Kia Spectra when you need it, across the entire RPM range. The other guys expect you to spin your engine to 6500RPM before their alternator makes the rated output while their idle output is actually lower than your factory Kia alternator! Daily Driver & Competition Ready - All of our alternators can be used for daily driving or competitions without a problem. These are the most reliable, highest output alternators on the planet designed specifically for your Kia Spectra. Our unconditional one year warranty backs it up as well as our customer testimonials. Direct Fit | Bolt-On | Plug & Play - This is an exact-fit high output alternator designed specifically for your Kia Spectra5. No modifications to the Kia Spectra5 are necessary! Our unit mounts the same as your factory Kia Spectra5 alternator and utilizes the same electrical connections. 100AMPs @ Idle and Full Output Available at a Low 1200RPM! - Delivers the power on board your Kia Spectra5 when you need it, across the entire RPM range. The other guys expect you to spin your engine to 6500RPM before their alternator makes the rated output while their idle output is actually lower than your factory Kia alternator! Daily Driver & Competition Ready - All of our alternators can be used for daily driving or competitions without a problem. These are the most reliable, highest output alternators on the planet designed specifically for your Kia Spectra5. Our unconditional one year warranty backs it up as well as our customer testimonials. Direct Fit | Bolt-On | Plug & Play - This is an exact-fit high output alternator designed specifically for your Kia Sportage. No modifications to the Kia Sportage are necessary! Our unit mounts the same as your factory Kia Sportage alternator and utilizes the same electrical connections. 100AMPs @ Idle and Full Output Available at a Low 1200RPM! - Delivers the power on board your Kia Sportage when you need it, across the entire RPM range. The other guys expect you to spin your engine to 6500RPM before their alternator makes the rated output while their idle output is actually lower than your factory Kia alternator! Daily Driver & Competition Ready - All of our alternators can be used for daily driving or competitions without a problem. These are the most reliable, highest output alternators on the planet designed specifically for your Kia Sportage. Our unconditional one year warranty backs it up as well as our customer testimonials. Full Output: 250+ AMPS @ 1200 Engine RPM ! Direct Fit | Bolt-On | Plug & Play - This is an exact-fit high output alternator designed specifically for your Kia Sedona. No modifications to the Kia Sedona are necessary! Our unit mounts the same as your factory Kia Sedona alternator and utilizes the same electrical connections. 125AMPs @ Idle and Full Output Available at a Low 1200RPM! - Delivers the power on board your Kia Sedona when you need it, across the entire RPM range. The other guys expect you to spin your engine to 6500RPM before their alternator makes the rated output while their idle output is actually lower than your factory Kia alternator! Daily Driver & Competition Ready - All of our alternators can be used for daily driving or competitions without a problem. These are the most reliable, highest output alternators on the planet designed specifically for your Kia Sedona. Our unconditional one year warranty backs it up as well as our customer testimonials. Direct Fit | Bolt-On | Plug & Play - This is an exact-fit high output alternator designed specifically for your Kia Magentis. No modifications to the Kia Magentis are necessary! Our unit mounts the same as your factory Kia Magentis alternator and utilizes the same electrical connections. 100AMPs @ Idle and Full Output Available at a Low 1200RPM! - Delivers the power on board your Kia Magentis when you need it, across the entire RPM range. The other guys expect you to spin your engine to 6500RPM before their alternator makes the rated output while their idle output is actually lower than your factory Kia alternator! Daily Driver & Competition Ready - All of our alternators can be used for daily driving or competitions without a problem. These are the most reliable, highest output alternators on the planet designed specifically for your Kia Magentis. Our unconditional one year warranty backs it up as well as our customer testimonials. 125AMPs @ Idle and Full Output Available at a Low 1200RPM! - Delivers the power on board your Kia Magentis when you need it, across the entire RPM range. The other guys expect you to spin your engine to 6500RPM before their alternator makes the rated output while their idle output is actually lower than your factory Kia alternator!